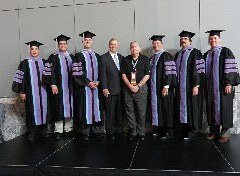 A Convocation ceremony to honor the new AGD Fellows, Masters, and LLSR recipients took place on Saturday, June 23, 2012 at the Pennsylvania Convention Center in Philadelphia, Pennsylvania. 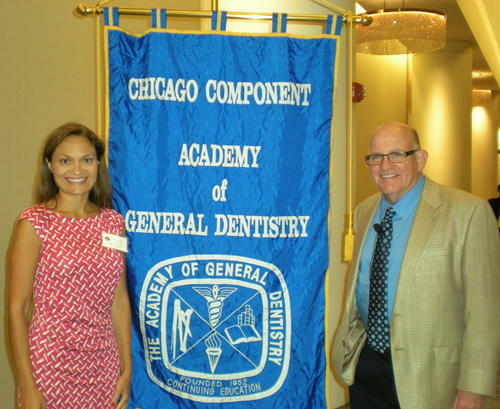 Fellowship and Mastership in the Academy of General Dentistry are prestigious symbols of dentistry’s continual journey toward improvement and progress. Masters and Fellows of the Academy embody the Academy’s principles and ideals and accept an obligation to continually prove themselves worthy of the designation throughout their professional life. To earn Fellowship, dentists must be Academy members for three consecutive years, earn a minimum of 500 approved continuing education credits, pass a comprehensive 250-question examination, apply for the award, and attend an AGD Convocation ceremony. To attain Mastership, members must be Fellows in the AGD who have earned an additional 600 approved continuing education credits, meeting the minimum requirements in each of the dental disciplines. In addition, 400 of the required credits must be in participation courses, where skills are learned through manipulation of dental materials. The final requirement of Mastership is to attend an AGD Convocation ceremony. The LifeLong Learning Learning & Service Recognition (LLSR) is a formal recognition for AGD Masters in the area of continuing education, dental related community service, and service to organized dentistry. The prestigious LLSR symbolizes a member’s dedication to remain current in dentistry and give back to his or her community. By embracing the core beliefs of the AGD throughout their careers, LLSR recipients have set a higher standard that all general dentists are encouraged to emulate. In the Academy’s 60-year history 15,343 members have earned Fellowship and 2,818 have received Mastership. During the AGD 2012 Convocation, 255 members received their Fellowship, 97 received Mastership, and 36 received their LLSR. To date fewer than 200 members have received the LLSR designation. This annual ceremony is the profession’s most prestigious event. It continues an annual tradition set in 1962, when the first 20 Fellows of the Academy of General Dentistry received their awards at a small dinner ceremony following a course presentation and business meeting. Gilbert Abdadilla, DDS, FAGD, Glendale Heights, Bryan A. Bauer, DDS, FAGD, Wheaton, Michael R. Errico, DDS, FAGD, Rolling Meadows, Joseph John Fornal, DDS, FAGD, West Chicago, Eloy Gutierrez, DDS, FAGD, Chicago, Bilus D. Poles, DDS, FAGD, Morton Grove, and Rene A. Tanquilut, DDS, FAGD, Naperville. James Kirk Hess, DDS, MAGD, Hillsboro, Eric G. Jackson, DDS, MAGD, Downers Grove, William R. Kisker, DMD, MAGD, Vernon Hills, and Paul E. Obrock, DMD, MAGD. Robert S. Kozelka, DDS. MAGD, Park Ridge, William M. Lawley, DDS, MAGD, Westchester and John F. Davis, DDS, MAGD. The Albert L. Borish Award is named for a blind AGD dentist whose name became synonymous with a passion for continuing education and the dental profession. This award recognizes individuals who have demonstrated innovation and leadership, dedication to the advancement of dentistry, and tenacity in pursuing idealistic goals, and who have made positive changes for the benefit of the dental profession and the dental health of the public. 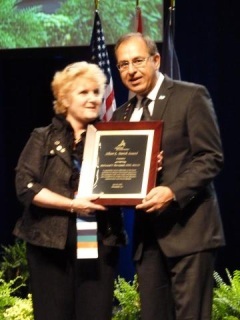 The 2012 Albert L. Borish Award was presented to Mohamed F. Harunani, DDS, MAGD, of Rockford, Illinois at the AGD Annual Meeting on Friday, June 22, 2012 during the morning General Session. The Illinois Academy of General Dentistry (IAGD) would like to offer their sincere congratulations to the 2012 Fellows, Masters, LLSR & Albert L. Borish recipients, and to their families for providing the support and encouragement to reach this goal. Thanks in part to widespread fluoridation, more people than ever before are keeping their teeth throughout their lives. But as people age, medical complications and other factors can negatively affect oral health. Evidence shows that older Americans are at risk for greater oral health problems than other groups because of age and the inability to get to a dentist’s office due to an existing medical condition or lack of transportation. Children or other relatives should take an active role in the oral health needs of elderly people residing in nursing homes. “Assisting with brushing, flossing and looking around the mouth for canker sores and abscesses can help ensure an elderly relative maintains their oral health, which in turn helps maintains one’s overall health. All oral health problems should be reported to the nursing staff for proper diagnosis and treatment,” says Dr. Chiappelli. According to the report, greater awareness among health care providers and caregivers can do much to ensure the elderly receive good oral health care, primarily through assessments of the patient’s mouth. Does the home have on-call dentists? Is nursing-home staff trained in basic mouth care? Is the staff trained to recognize oral problems? Does nursing home staff emphasize mouth care at least once a day? “If the staff or home administrator can’t say ‘yes’ to each of these questions, then a red flag should go up,” he says. Chicago AGD Presents its First Meeting of the 2012-13 Season. On September 5, 2012 65 dentists and 6 dental students gathered at the Renaissance Hotel in Schaumburg IL. to listen to Ross Nash DDS lecture on “Esthetics in Action”. Dr. Nash examined a wide array of cosmetic cases, dealing with direct bonded composites, veneers, inlays, onlays, and full coverage restorations. Occlusion and minor tooth movement were also discussed. At lunch, the annual meeting of the Illinois AGD was held. Dr. Robert Kozelka, IAGD President, presided at the meeting with Regional Director Sy Wachtenheim DDS officiating at the induction of the new officers and board members. Congratulations to everyone! The Chicago AGD would like to thank our sponsors for this seminar: BISCO, Garrison Dental,SS White and PNC Bank.